Lima (Agenzia Fides) - From March 1st to March 16th the "Tenderness footprints" ("Caminata Huellas de Ternura") will touch the main cities of Peru. Starting from La Tina - Macará International Bridge, in the diocese of Chulucanas, Piura, in the presence of Mgr. Fortunato Pablo Urcey, President of Caritas Perú and Secretary General, Eng. Ramiro Mendoza, the march will cross the most important inhabited centers of the nation: Piura, Chiclayo, Trujillo, Chimbote, Huacho, Lima, Callao, Mollendo, Chala, Moquegua and Juli. Therefore, after 15 days, it will reach Bolivia to continue its journey across the south of the continent. 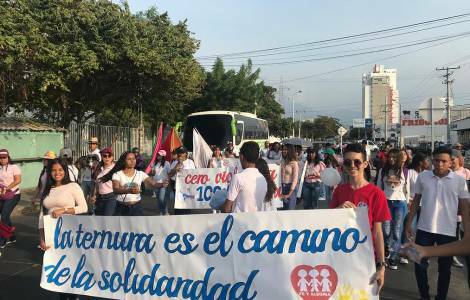 The march in fact runs through Latin America and the Caribbean, from Mexico to Patagonia, to denounce the various forms of violence that occur against boys and girls, proposing tenderness as a way to promote the life and dignity of the youngest. According to Unicef, every day 220 minors under 18 die from the consequences of family violence. Aware of this situation of abandonment and of interpersonal and structural violence that attacks the life and dignity of many children, teenagers and adolescents in Latin America, CELAM (Latin American Episcopal Council), Caritas Latin America and Caribe SELACC, together with World Vision and the international federation Fe y Alegría have promoted this ecumenical social mobilization.